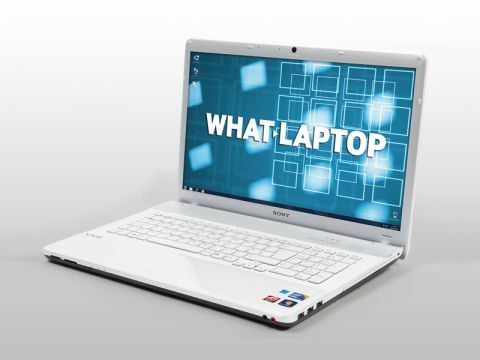 Sony's VAIO E-Series is targeted at those after affordable multimedia functionality for the whole family. The VAIO VPCEC1M1E/WI is a 17.3-inch machine that offers great usability and comfort and provides more than enough power for multimedia use. The 17.3-inch widescreen display dominates the chassis. Its 1600 x 900-pixel resolution is very sharp and colour reproduction is excellent, making this machine ideal for those who want to edit their holiday snaps and enjoy movies. The size of the screen means portability suffers, however. At 3.1kg it's not the lightest machine to carry – although it is comfortable enough to use around the house – and the battery life of 110-minutes is shocking. We expect a minimum of 180 minutes from modern laptops, meaning the Sony falls far short of expectations. This drops yet further when watching DVDs, which is a poor showing for a machine designed for multimedia use. Nevertheless, the chassis' design is attractive. The matt-silver lid doesn't easily scratch or attract fingerprints, while the white interior looks great. The palmrest does feature a glitter effect, however, which may not suit all tastes. Three hotkeys are fitted on the chassis, just above the keyboard. The Assist button helps you diagnose and solve any issues you may have with the laptop, while the Web button lets you boot up a secondary, Linux-based operating system for browsing the web without starting up Windows 7. Finally, the VAIO button allows quick and easy access to all your multimedia files. The keyboard stands out as one of the best we've used in a long time. There's no flex and the travel and weight of the keys is just right, meaning a very comfortable and intuitive experience. Intel's latest Core i3 processing technology is on board, as well as 4096MB of memory. Performance is decent as a result and you'll be able to run office applications with ease, as well as photo or movie editing suites without issues. Graphical performance also impressed, thanks to the ATi graphics card and 512MB of dedicated video memory. You won't be able to play the latest games with all the settings turned up, but older games will run fine and you'll be able to edit high-definition (HD) movies without a problem. A 500GB hard drive is also included, offering you plenty of storage space for all your files and folders. We are big fans of the VAIO E-Series machines we've seen in the past, and the VPCEC1M1E/WI is no exception. It's a comfortable and powerful machine, but it's just a shame mobility is so poor.